Black plastic ball cup with 4 centering fingers to help keep ball centered when kicking. Used on vertical up-kicker (VUK) mechanisms in many Bally and Williams games. 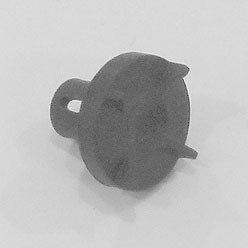 Includes slotted neck for mounting on A-11336 plunger with pin (not included). Will not fit/work with Data East plunger # 515-5352-00- you must use the Bally/Williams plunger # A-11336 with this part. Doctor Who (Bally) Ball Popper Armature Assy.